PEPLUM TV: Ray Harryhausen R.I.P. 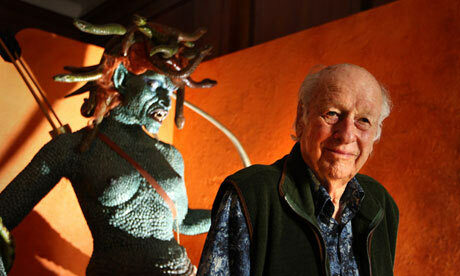 Stop motion effects master Ray Harryhausen died today of the age of 92. He started his film career with MIGHTY JOE YOUNG and became a special effects technician with IT CAME FROM BENEATH THE SEA. His first PEPLUM film was THE 7TH VOYAGE OF SINBAD, which became a big hit and forever changed the Sinbad character as someone who battles monsters and sorcerers, not just a sailor conquering women across the 7 seas. His next big Sword & Sandal project was JASON & THE ARGONAUTS and later in the 1970s with THE GOLDEN VOYAGE OF SINBAD and SINBAD AND THE EYE OF THE TIGER. He returned to Greek mythology with CLASH OF THE TITANS (1981), which featured, without a doubt, his greatest creation, the Medusa (pictured above), among other fantastic characters populating that film which would be his last feature length film. I saw COTT when it was released back in the day and the Medusa was truly memorable! I only recently discovered his Kerwin Matthews films, THREE WORLDS OF GULLIVER being particularly brilliant, and 7TH VOYAGE OF SINBAD. Every holiday season here the original CLASH OF THE TITANS is aired, and we enjoy it all over again. MYSTERIOUS ISLAND is terrific too .... those films marvellously mixed great casts with those terrific effects, ok some of them look a bit cheesy now in this CGI age, but for their time were ground-breaking. This man influenced my life more than any other person in pop culture. We shall never see his like again.